Christmas is only five days away! We have Scott’s parents coming in town today from North Carolina, Thursday the kids get to play Christmas songs on a grand piano at a local grocery store, Saturday we will act out the nativity and sing lots of Christmas songs, and Sunday after stockings and gifts, we’ll go to church for an hour where Scott, me and Elisabeth will be performing (our church will do all musical numbers with a little narration on Christmas Sunday; no actual classes), and then we’ll come home and have a brunch with cinnamon rolls and egg casserole! So it’ll be a full and joyful week! And I cannot tell you how long I have been dreaming about having cinnamon rolls. I only make them a couple of times a year because 1) they’re time consuming and 2) (and most importantly) I love them SO much that I always eat too many . Here is my overnight cinnamon roll recipe(who wants to be making dough Christmas morning? not me) if you want to give them a try; they’re all whole grain and SUPER soft and delicious. 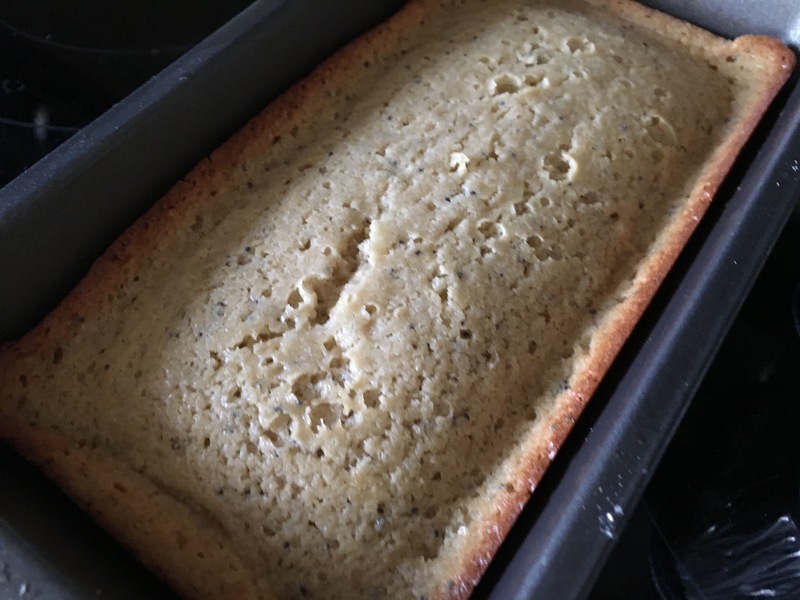 We made a couple of different foods to give away as neighbor/teacher gifts, a chex mix and this poppy seed bread which is made with half whole wheat flour and is sweetened with honey and apple sauce. 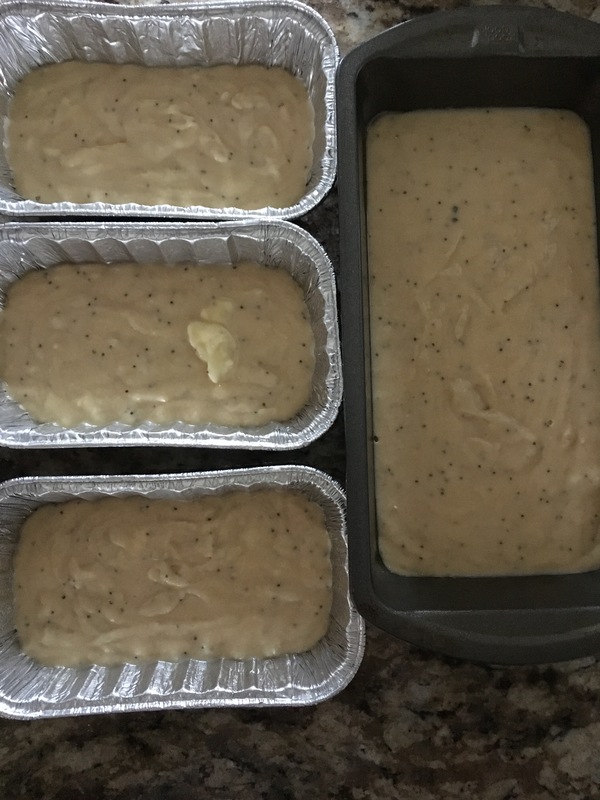 We kept a loaf for our family and gave away three mini loaves and the next day my kids begged me to make more, and this time a double batch because it “wasn’t enough” :)! 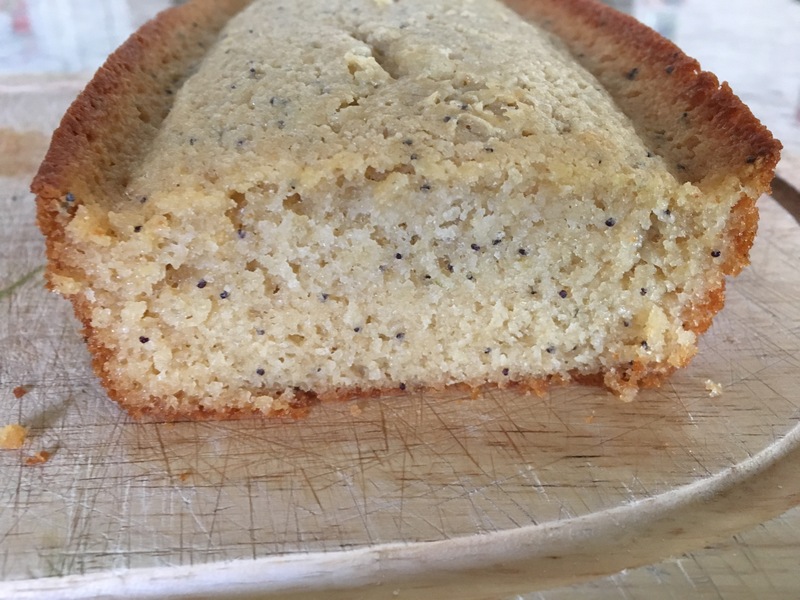 We love poppy seed bread at Christmas, and all the time! Preheat oven to 325 degrees. 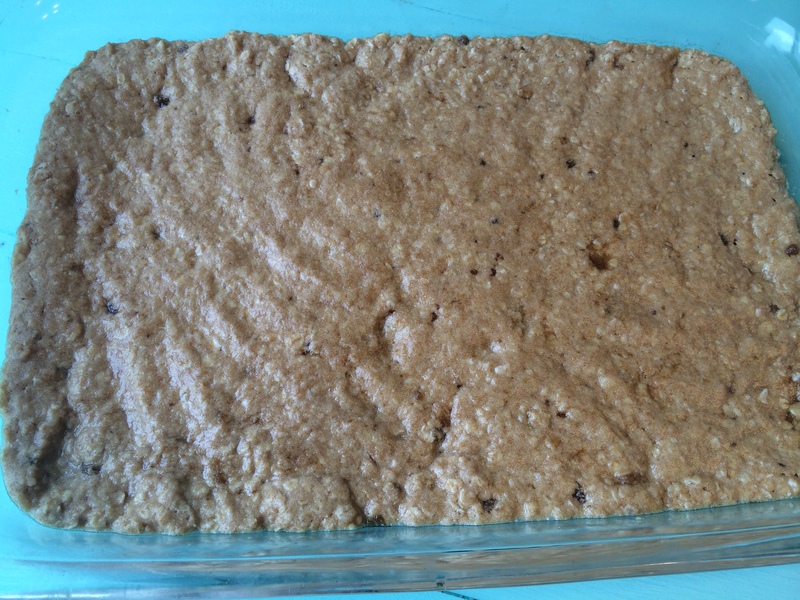 Grease and flour 2, 8×4 inch loaf pans (or 6 mini loaves, or a combo of the two) and set aside. Cream butter, applesauce, oil, eggs, milk, honey, and extracts. Add remaining ingredients and cream until blended but not over mixed. 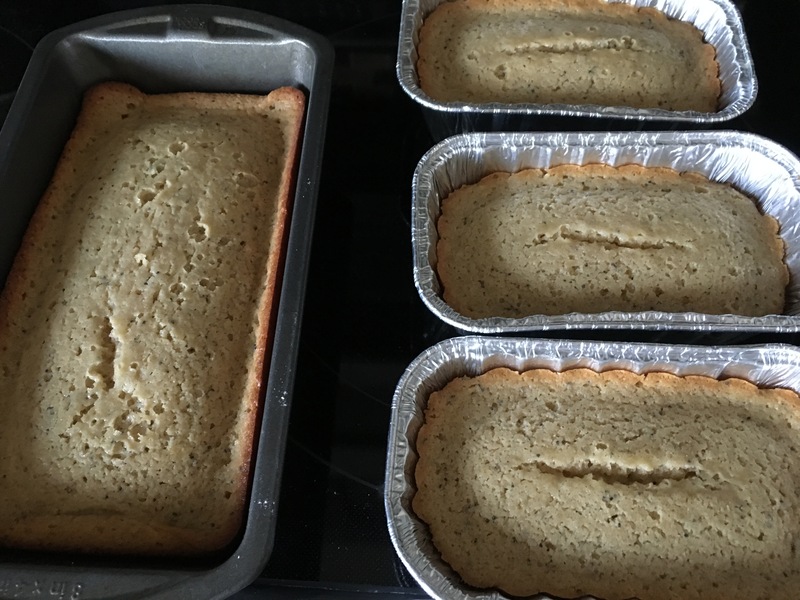 Bake loaf pans 45 minutes (edges browning, tooth pick comes out clean), mini loaves 35 minutes. *Always check pan five minutes before timer goes off because different ovens cook differently so it may need a little less or a little more time. My dad was born and raised in Mexico, and my mom is from Washington state. They raised us in Washington but we had several Mexican traditions that we continued to do over the years. 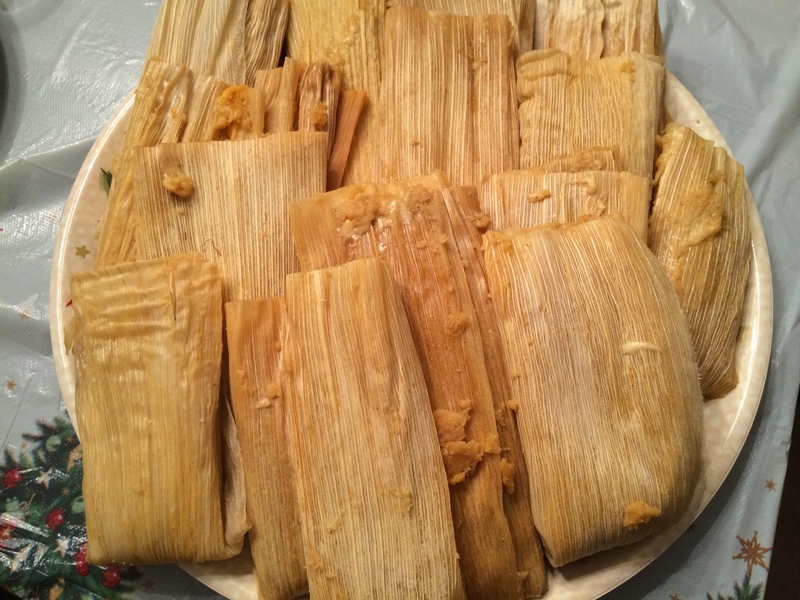 I remember quite a few Christmases when we’d sit down around the table (mostly the women in our family and some extended family) and pat masa into corn husks, making tamales. 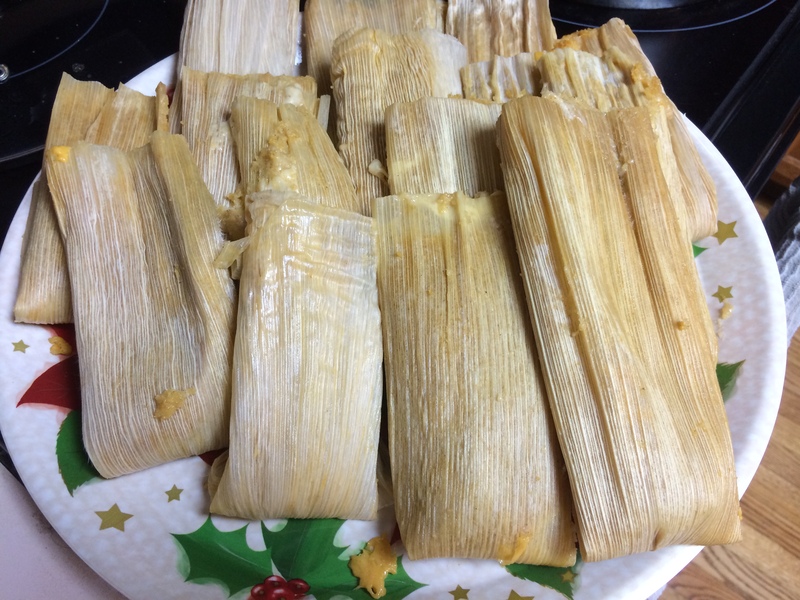 I think Christmas is the perfect day to make tamales because you have the family home and so there are lots of hands to help make each individual tamale. Scott and I made tamales last year on Christmas and we loved them so much that we’ve decided to continue that tradition with our family. 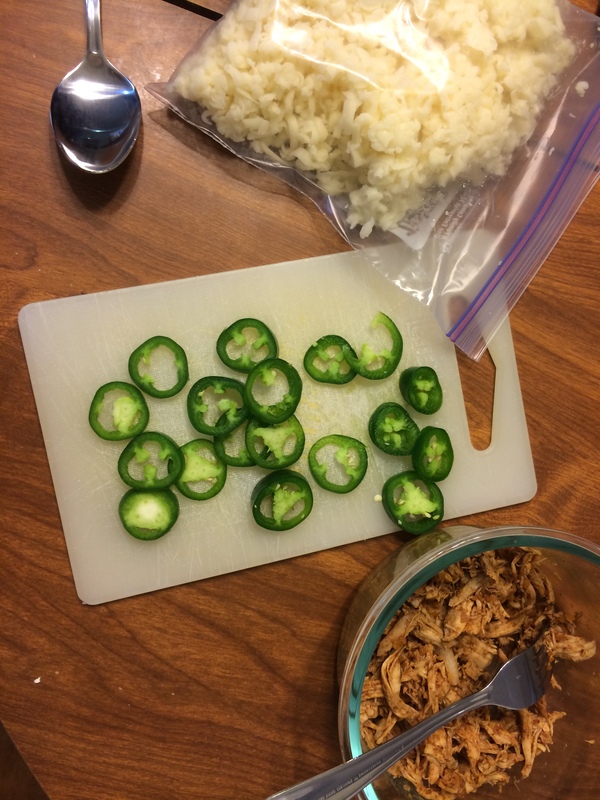 I am a vegetarian so we make some for me that are filled with mozarella cheese and some diced jalapeno, and some that are filled with shredded Mexican chicken. I found these corn husks in the produce area of our local grocery store, but you could also find them down the Mexican food aisle. Be sure you soak the corn husks in water, like I’m doing below in this picture. I just soak them for several minutes to soften them. I used this masa harina to make the masa, along with lard and water. The masa turns out like a cookie dough consistency, maybe just a tiny bit thinner. You pat the masa into a corn husk like so, leaving some space at the bottom. Sometimes I’ll stick two small corn husks together to make a large one. 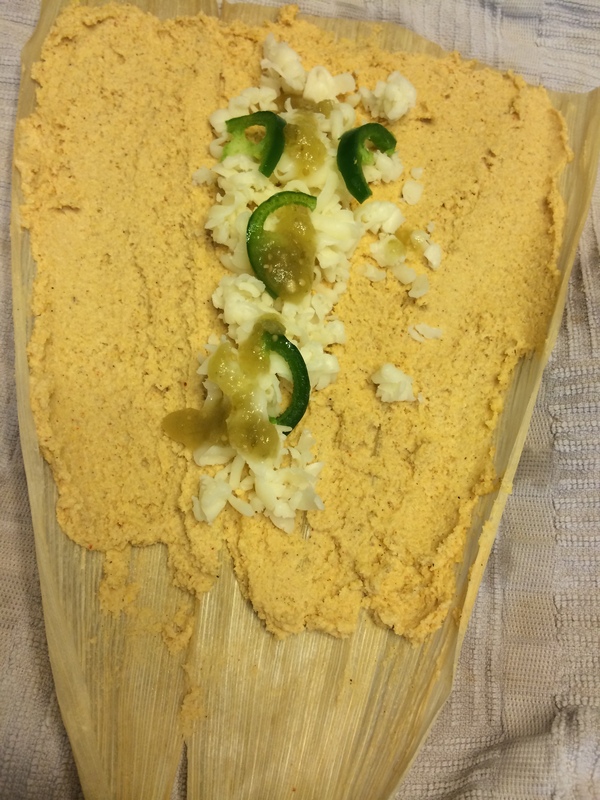 Here’s the veggie tamale just before we folded it in thirds and rolled it. 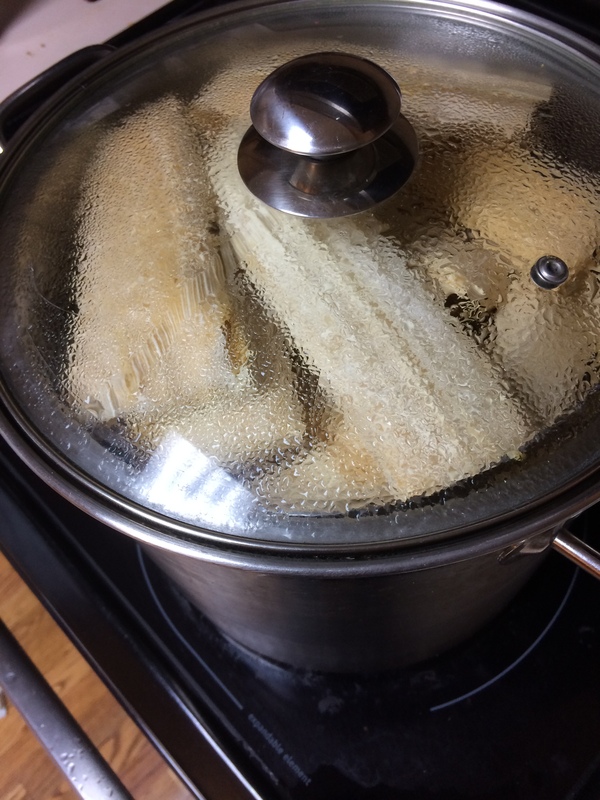 I steam our tamales in a large stock pot with a steamer attachment. We fit about 18 in here. 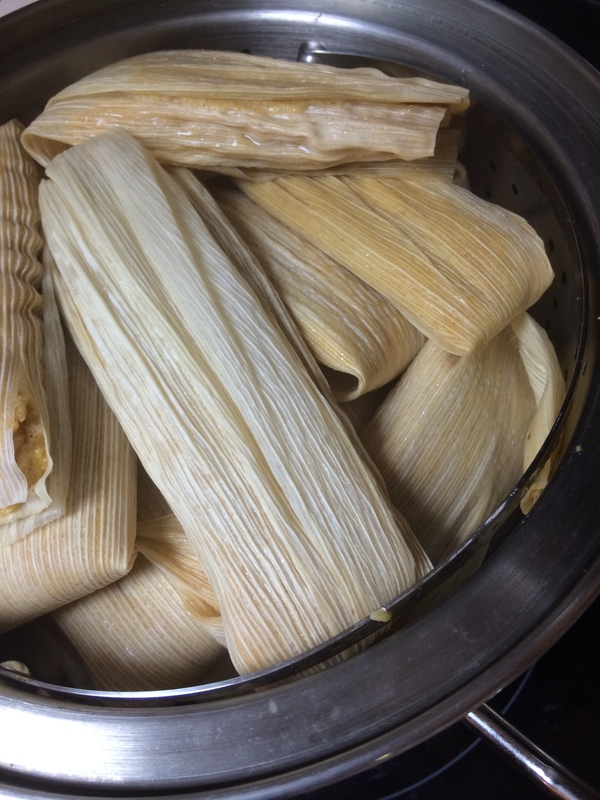 I remember my aunt making some sort of a tinfoil contraption in the bottom of her stock pot that she used as a center piece and would lean tamales against it, and she could make a lot more that way. 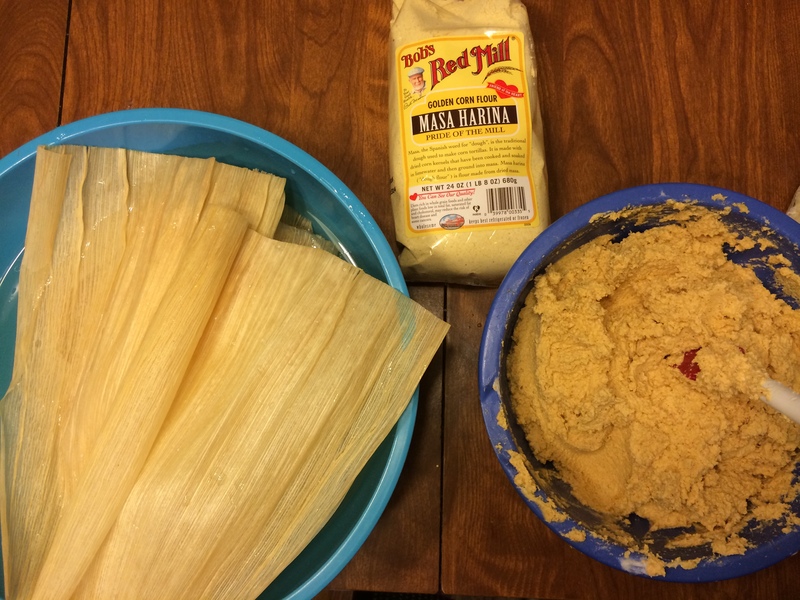 Tamales cook for awhile; around an hour and 2o minutes so plan ahead. But they are so worth the time. 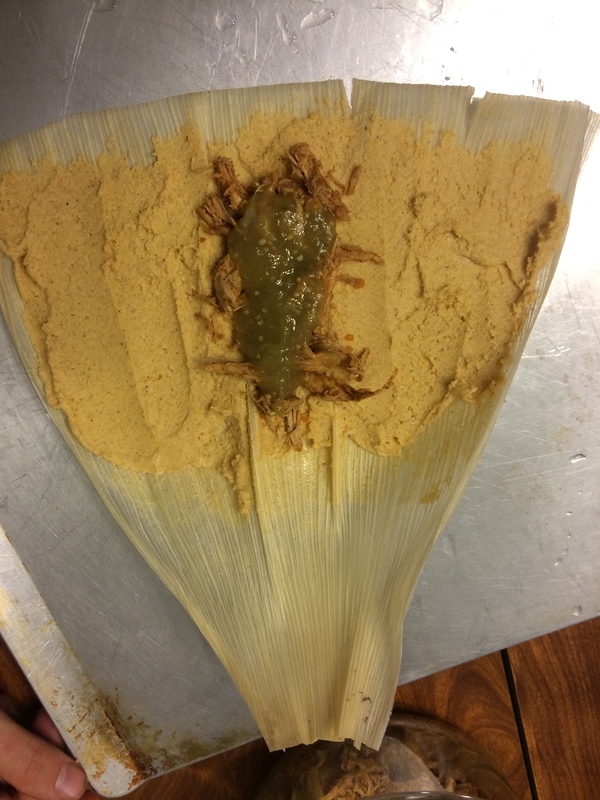 We sure love tamales! 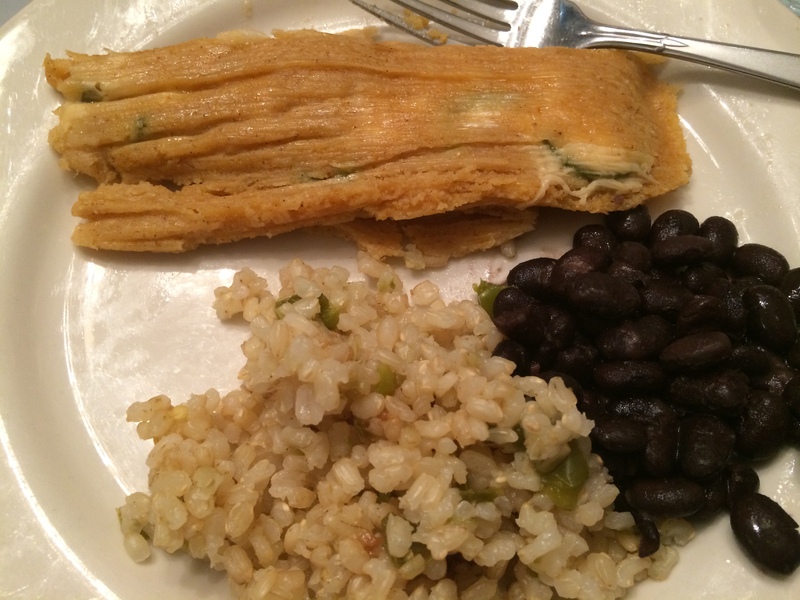 We like to eat our tamales with a side of rice and black beans. Merry Christmas! In a large mixing bowl, soak about 20 large corn husks for several minutes to soften them(if you don’t have enough large corn husks, you can put a couple smaller ones together). Bring a large stock pot with a steamer attached, to a boil; fill water up about half way because you’ll be steaming for about an hour an a half and you don’t want all your water to evaporate. Whip the lard until fluffy. Blend in everything else, adding enough water that the masa is not stiff and is easy to smear over husks, but not watery. Smear a thin layer of masa, about 1/4 inch thick, over each husk, patting it in, and leaving a couple of inches at the bottom of the husk, without masa. Add 1-2 Tbsp of filling to the center. 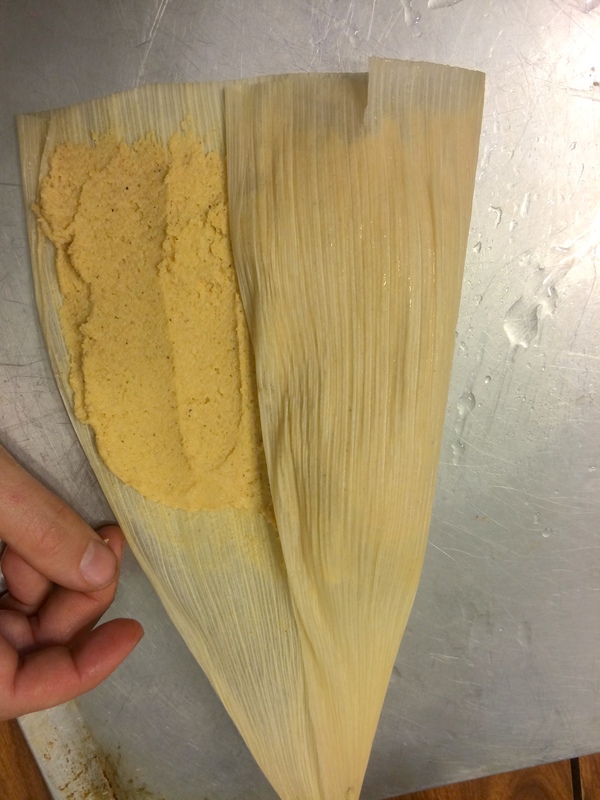 Fold in thirds over the filling, loosely sealing the ends of the masa by pressing together. Place in a large steamer, stacked, and steam until masa dough is firm, about 1 hour and a half. To check if done, open one of the larger ones and see if the masa has cooked through the middle; sometimes you’ll have to take out the smaller ones first and then cook the bigger ones another ten minutes or so. 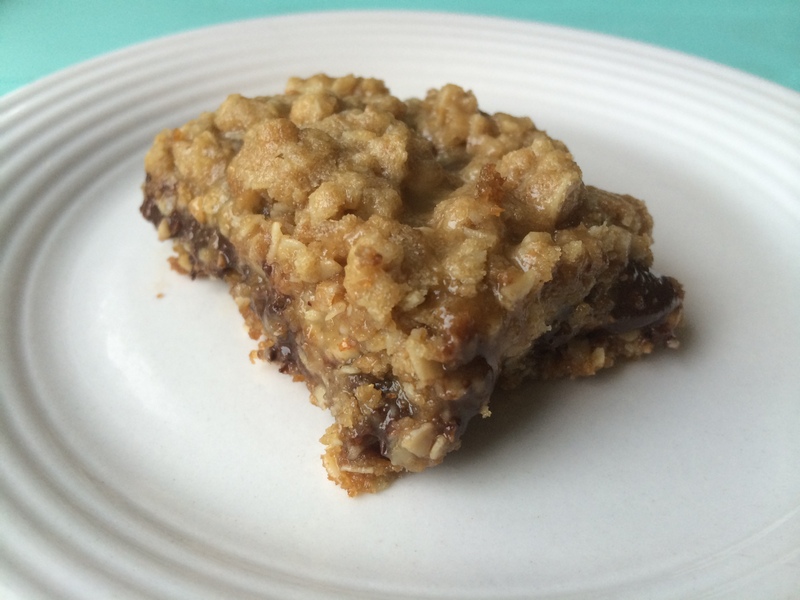 This has been my “dessert of choice” for years, but I still only make it when there’s going to be a crowd because it makes a lot and they’re not exactly a health food, though I do use more whole foods ingredients in this recipe. 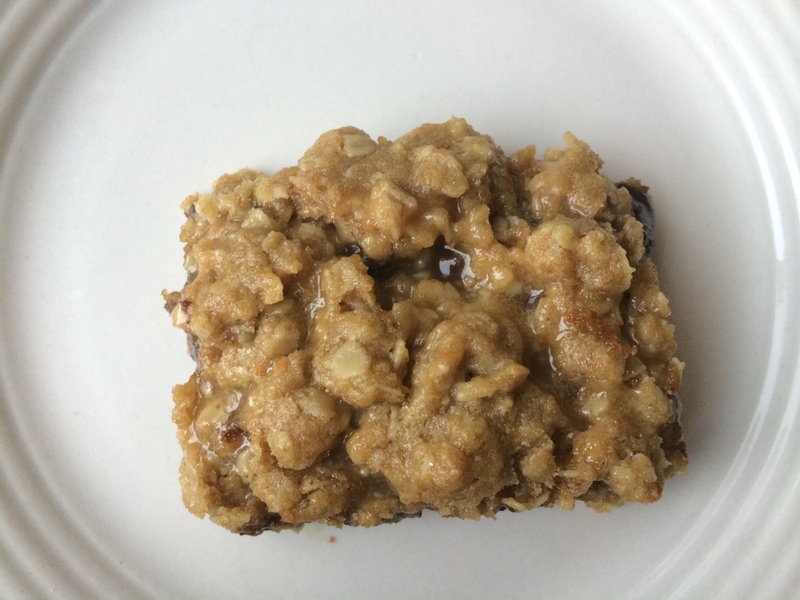 These carmelitos are ooey-gooey and sweet but mixed with oats and finely chopped nuts, and it’s just absolute perfection. 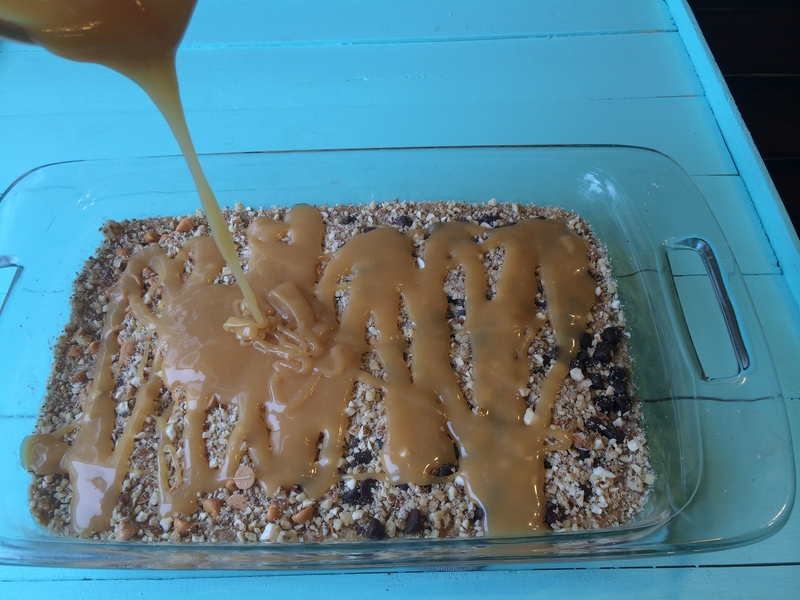 I’ve been waiting to share this recipe because I wanted to come up with a caramel recipe from scratch, rather than using a jar from the grocery store (which you still can do, and I still do if I’m in a time crunch; but I think from scratch is always better tasting and better for you). And I have a good recipe for caramel now that I made those honey caramel apples! You follow that recipe for caramel exactly, until you get to the boiling part. Instead of boiling it until it reaches 260 degrees (hard ball stage) you boil it until it’s 235 degrees or in the soft ball stage. Then set it aside and get started on your carmelitos. Here are the ingredients you’ll need. Because I don’t eat chocolate, I’ll usually use half dark chocolate chips and half white or butterscotch chips. And you can either buy a can of already chopped nuts, or you can chop them yourself. I chop them myself because I’ll always have lots of nuts on hand. And you can really use any kind of nut. Pictured below I have walnuts, almonds and pecans. You can do one type of nut or a variety. 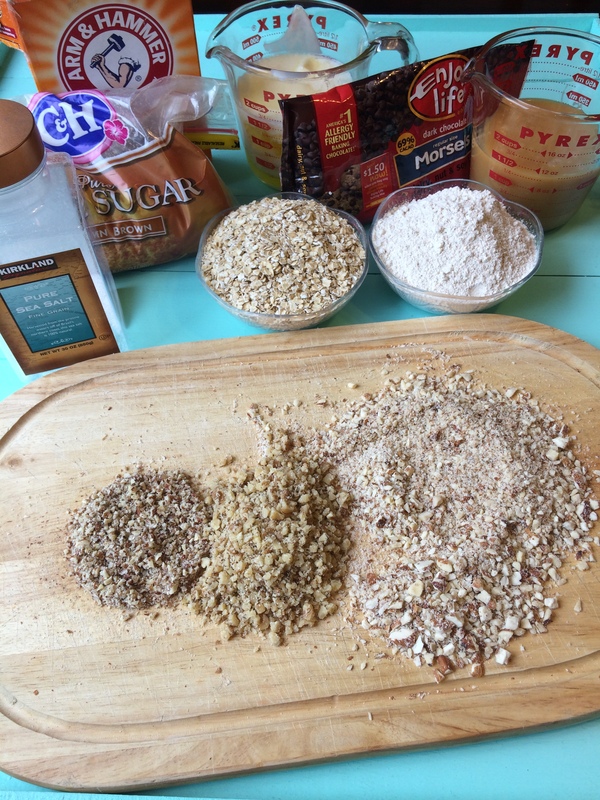 In a large mixing bowl combine flour, oats, brown sugar, soda and salt. Stir to combine and then add melted butter. Press 2/3 of this dough into the bottom of a 9×13 pan and bake at 350 degrees for 10 minutes. 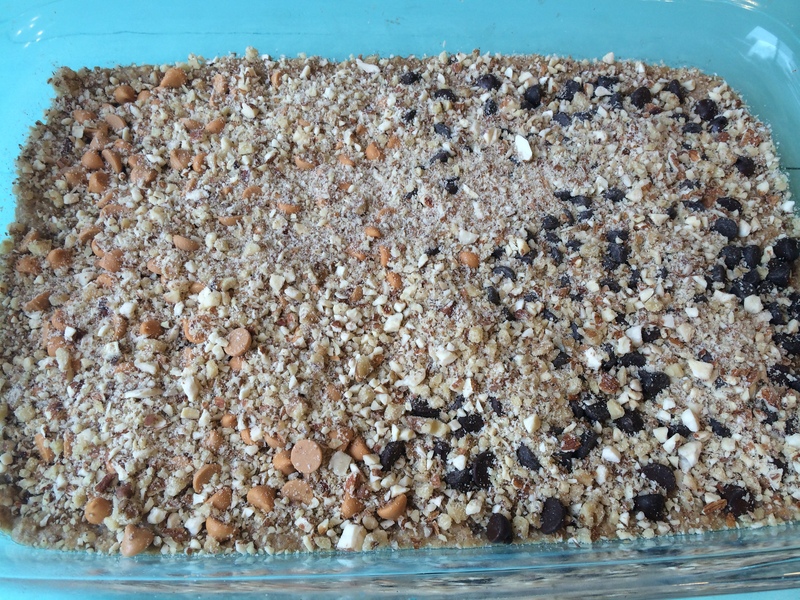 Remove from oven and sprinkle with chocolate chips and chopped nuts. Stir together your caramel and the 5 Tbsp flour and pour over the top of the pan (avoid edges as it will cook to it). 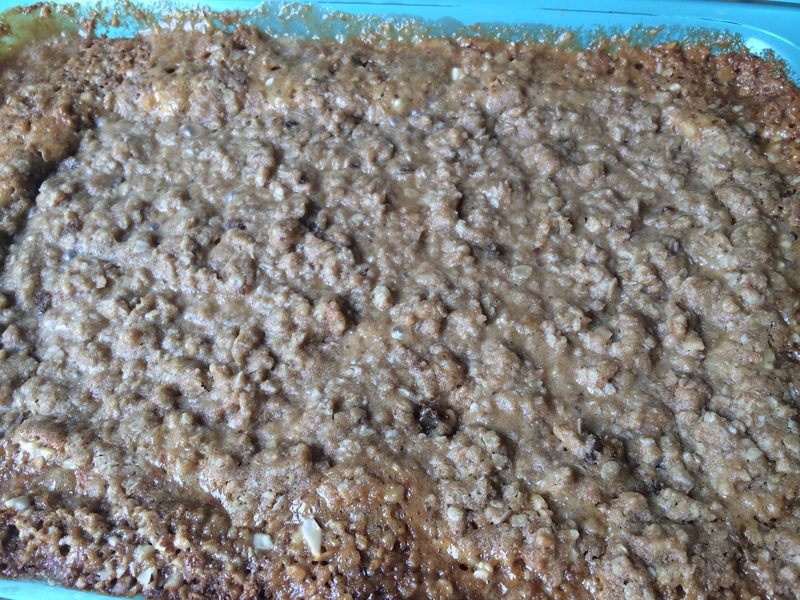 Crumble the remaining dough over the top and bake for another 20 minutes. Remove from oven and allow to cool in pan before serving. It still looks a bit gooey when it comes out, though the edges will look more done. That’s perfect! Once the chocolate and caramel cool for a bit, it won’t be quite as gooey. If you’re making caramel from scratch, do that first and set aside for use later in the recipe. In a large mixing bowl combine flour, oats, brown sugar, soda and salt. Stir to combine and then add melted butter. Press 2/3 of this dough into the bottom of a 9×13 pan and bake at 350 degrees for 10 minutes. Remove from oven and sprinkle with chocolate chips and chopped nuts. Stir together your caramel and the 5 Tbsp flour and pour over the top of the pan (avoid edges as it will cook to it). 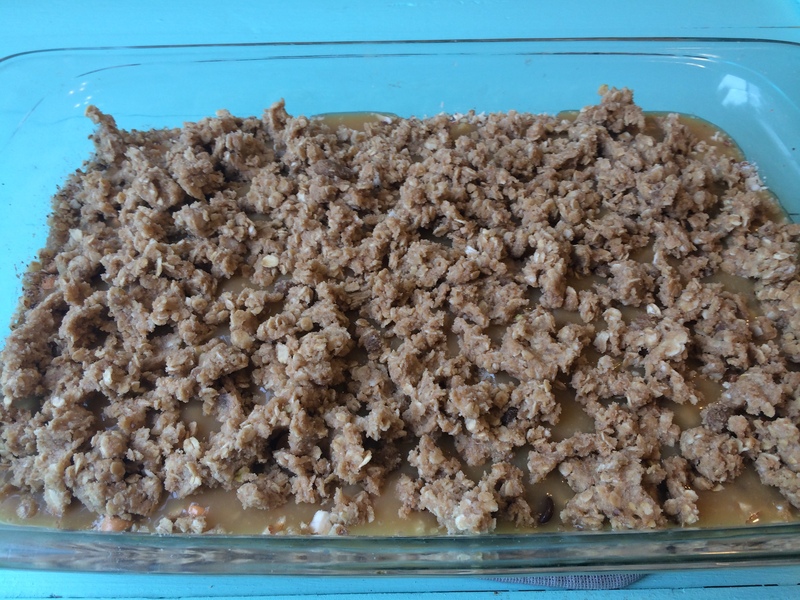 Crumble the remaining dough over the top and bake for another 20 minutes. 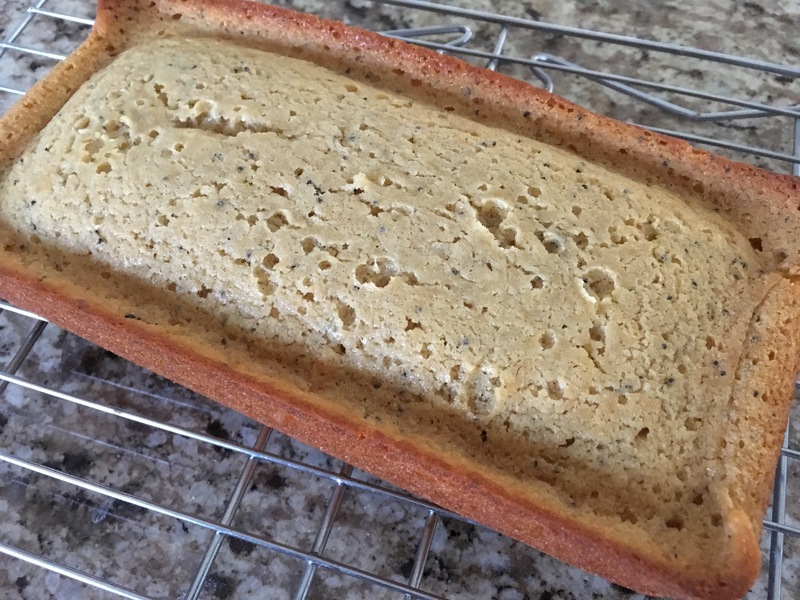 Remove from oven and allow to cool in pan before serving.